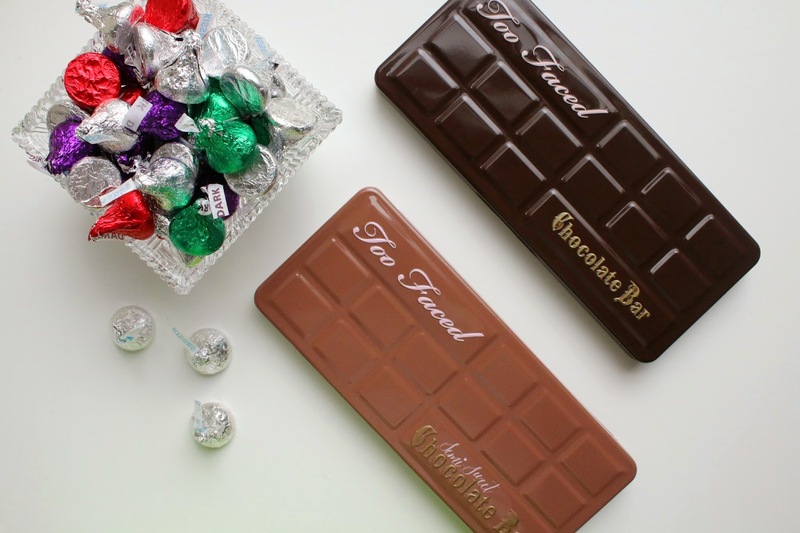 After loving the first Too Faced Chocolate Bar palette (review here), I had a sneaking suspicion I would adore the Semi-Sweet Chocolate Bar palette. And I was right. I absolutely do. But I do see a few differences so I figured I would do a blog post to help compare one palette to the other. For those of you who may be on the fence about which one to get, hopefully this will help you make your decision, or completely confuse you - whoops, sorry! Here is a look first at the two palettes next to one another. 1. Pigmentation - As far as pigmentation, intensity and pay-off, I find that they are both very similar. 2. Matte vs shimmer shadows - The Semi-Sweet palette has 7 matte shadows whereas the original Chocolate Bar palette has 6. For those of us that love matte shadows, that extra one could really be the deciding factor. 3. Wearability - Sorry to say for those of you looking for a major difference here - there is little to no difference. They both blend beautifully and wear all day long with little to no creasing (with an eye primer - I currently use this one). 4. Color comparison - Many people have been saying that the new Semi-Sweet is much warmer than the original, but I actually find it to be slightly the opposite. There are definitely more cool and gray-toned shades in the Semi-Sweet palette that balance out nicely with the warmer shades. 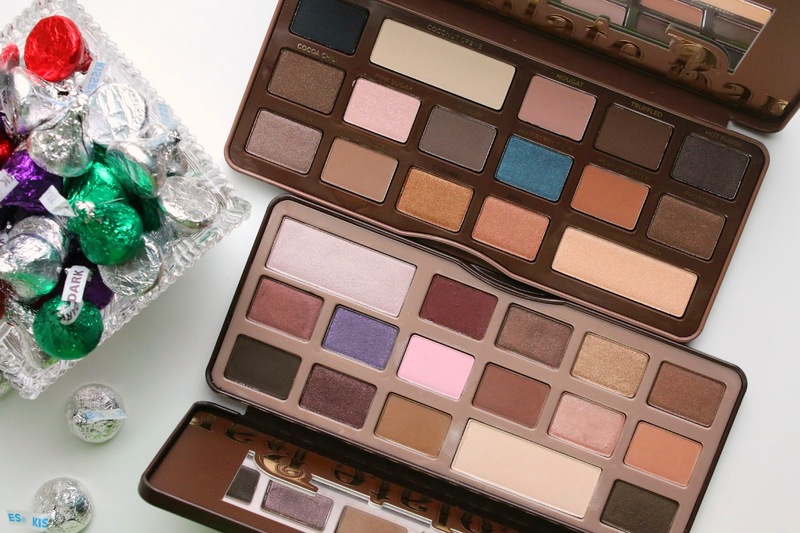 Obviously there is a wild card shade in each palette - the Chocolate Bar's is the sparkly purple and the Semi-Sweet's is the vibrant teal. I find that the purple is more wearable and easier to incorporate into different looks, but I prefer the finish/texture of the teal. So it's a draw for me on that point! Another major difference is the inky, rich black shade in the Semi-Sweet palette that may or may not be a major draw for some people. It definitely is quite pigmented and wears well as a liner or addition to a smokey eye, but for some people it may just be too much. I am neutral on the matter - I could take or leave it. 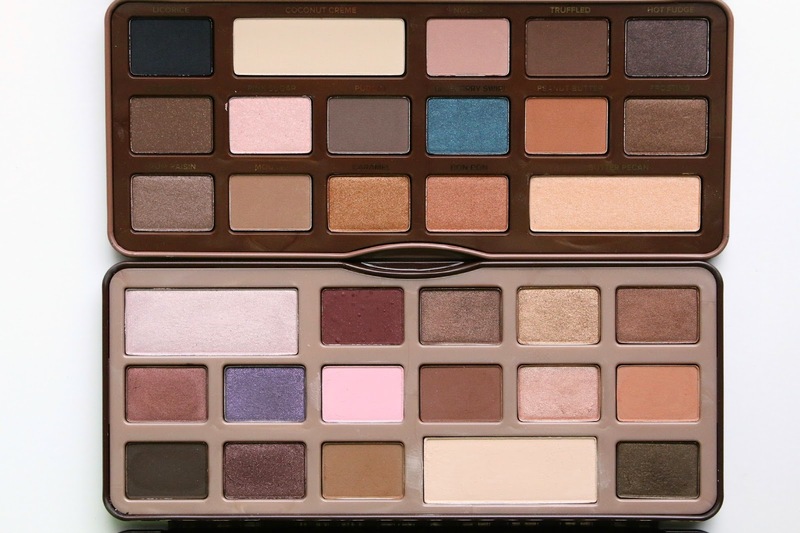 I do love the matte beige better in the Chocolate Bar palette, but prefer the browns in the Semi-Sweet palette. Trust me, there are a million of these distinctions I could make for either palette, so it will ultimately come down to your personal taste. 5. Smell - Surprisingly I found that the original Chocolate Bar palette had a stronger initial chocolate scent than the Semi-Sweet. I don't particularly mind it one way or another, but if the chocolate aroma really pulled you in, then just know that the Semi-Sweet scent is much less powerful. 6. Case/packaging - They both have a magnetic closure, but the original chocolate bar definitely has a stronger magnet. I found that the Semi-Sweet's magnet was just a tad weaker. That being said, I did an upside down test on both and found that they both stayed shut, so that sort of negates the difference but I felt it was worth pointing out. 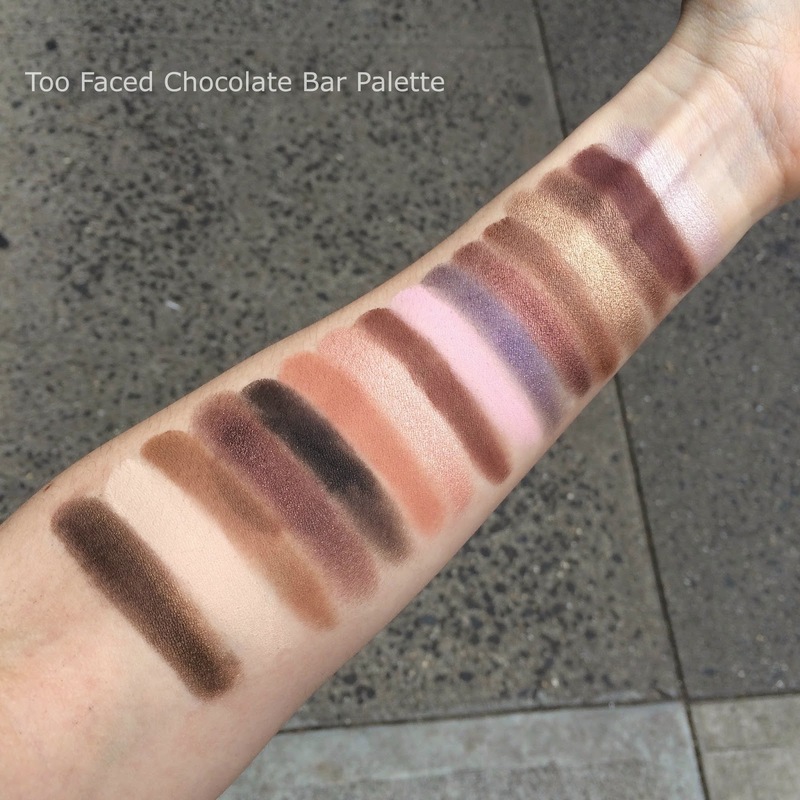 I did also notice that the Chocolate Bar palette seems to be a touch heavier in weight than the Semi-Sweet. It may not register heavier on a scale per se, but when I hold both of them, that's what jumps out at me first. It's a really tough decision, because I honestly adore them both so much, but if I had to choose just one - it would be the new Semi-Sweet palette. The addition of more matte shades and cool toned colors really appeals to me and helps make it a balanced assortment of shades. But many of you may just splurge for both, and I can't fault you for that - they are such a draw and I guarantee you will be happy with either. 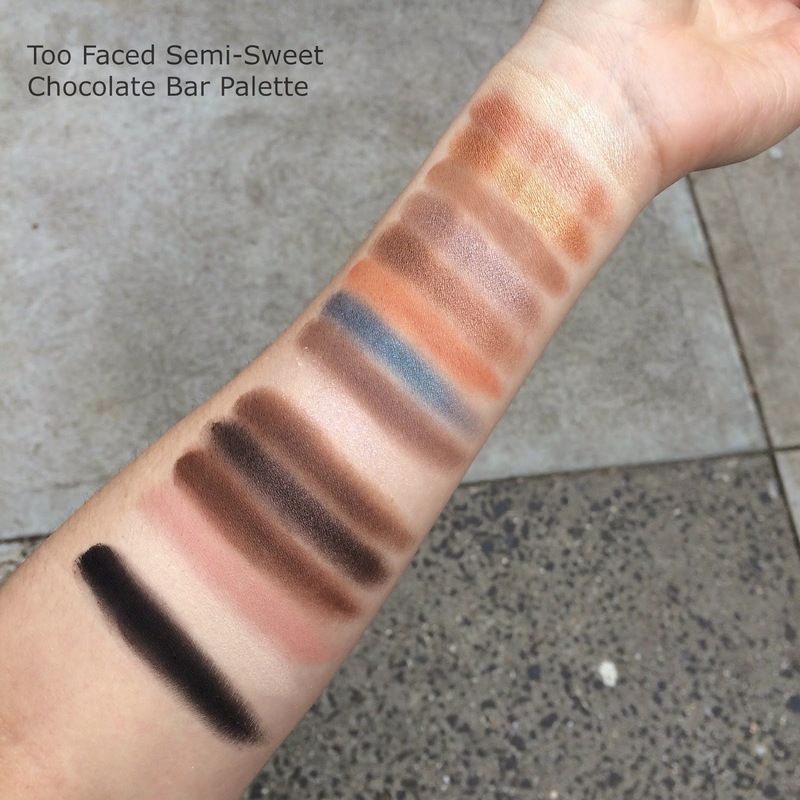 Have you tried the new Semi-Sweet palette? Which one is your favorite? Great comparison post! I don't have either of these, but both of them are very appealing to me! I don't think I could really pick between them either, so I guess I just shouldn't buy any of them! Well, my bank account would thank me for that. Awesome post!!! I still can't decide on which I prefer because you're right they're both gorgeous.